The affordable, fun-packed, Wi-Fi tablet for kids that allows them to learn and play in a way that's just right for each child. 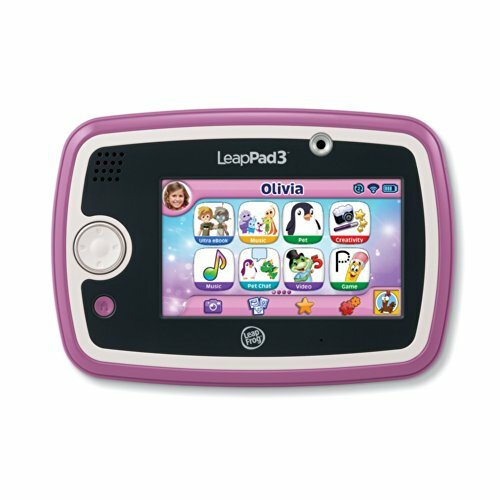 Discover exciting experiences and thrilling adventures with the LeapPad3. This high-performance Wi-Fi tablet includes a fast, powerful quad-core processor and sleek design. Designed for children 3-9 years old. Features a shatter safe 5" capacitive touchscreen that's highly responsive-perfect for a child's light touch. LeapSearch serves up only age-appropriate videos and more from the web - all approved by learning experts. Built kid-tough and thoroughly drop tested, the LeapPad3 tablet is perfect for worry-free fun. Enjoy hours of play with LeapFrog's lithium ion rechargeable battery that's easy to recharge via USB or AC adapter. 4GB of memory. Access LeapFrog's learning library of 1000+ educational games, eBooks, videos and more. Games automatically adapt to your child's learning level and draw from 2,600 skills across reading, math, writing and more. Strong parent tools let you fine-tune and control what your child is able to access. Sign up to receive learning tips and progress updates to see how your child's skills are developing as they play. If you have any questions about this product by LeapFrog, contact us by completing and submitting the form below. If you are looking for a specif part number, please include it with your message.